A recent article in Atlantic Monthly by historian Robert Dallek about the illnesses and medications used by John F. Kennedy as congressman, senator and president has loosed a torrent of articles critical of the President. Read and comment on this editorial from the Buffalo Times that says that we shouldn't be proud that our society is obsessed with a man's, or woman's, weaknesses to the exclusion of their gifts and their accomplishments. A well-intended article in Atlantic Monthly by historian Robert Dallek about the illnesses and medications used by John F. Kennedy as congressman, senator and president has loosed a torrent of coarse articles by the right-wing and gotcha press. The reactions range from charges of a massive coverup by the press and Kennedy's corps of attendants to speculations about whether he could ever have been elected president had the truth been known. "Kennedy Had a Cocktail of Drugs." "Kennedy Popped Lots of Pills." Central to all this is a device necessary to sensationalist writing: That nobody, or hardly anybody, really knew how afflicted JFK was when he ran for those offices, and that important information about his health was closely held, even after his death, until now. The truth is that Kennedy's frail health was well known to the voters of Massachusetts when they sent him -- on a magic carpet of Joe Kennedy's money -- to the House and Senate. Even sympathetic biographers wrote during the 1960 presidential campaign that Kennedy had to be brought home sick from the Choate Prep school. Many biographies of that time carried pictures of Kennedy being airlifted home from a dangerous operation on his back in 1954 -- his second spinal surgery -- only months before he ran for the U.S. Senate. 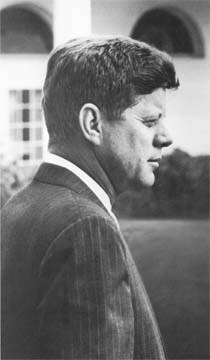 The articles noted that Kennedy had his first back operation in 1944. The political spin of that day was: Here you have a brilliant, suave and well-educated war hero, so wealthy he won't need to steal while in public office, a man who has experienced pain and near- death. Thirty-nine years after his assassination, Kennedy's story is still the same, despite these "revelations," and the nation and its political system have still not recovered from the way he was taken from us. Some of the articles, particularly a graceless piece by Peggy Noonan in Friday's Wall Street Journal, suggest that many would like to assassinate him all over again. The implications of a post-mortem coverup are baseless as well. The piles of books written about Kennedy, his wife, his father and his brothers all detail the suffering he endured from illnesses and the volatile mix of drugs he was taking over the years. A dozen years ago, for example, C. David Heymann, in his biography, "A Woman Named Jackie," outlined Kennedy's experience with Addison's Disease, which causes an adrenal deficiency, and JFK's excruciating back pain. For these, Heymann writes, Kennedy took steroids and cortisone. He chronicles Kennedy's addiction to an injected concoction of drugs whipped up by the controversial Dr. Max Jacobson of Manhattan, known as Doctor Feelgood. The mix, to which the first lady was also addicted, contained amphetamines, called "speed" on the street. When brother Bobby complained to the president about the stuff, JFK replied, "I don't care if it's horse piss. It works." The question about whether we would have elected JFK president if we had known all about his health is a useful one. Extend that question to disposition, mental health and honesty and it becomes an even better one. Would Americans have given Woodrow Wilson a second term if they had known that he suffered from small strokes before 1916? Or, Franklin Delano Roosevelt, if they knew the degree of his suffering, depression and his cardiovascular condition? Or Lyndon B. Johnson if we knew in 1964 what Robert Caro has told us since about his crookedness? Or Richard M. Nixon's descents into alcoholism, paranoia and delusion under pressure? A sage man said it can be disorienting to look at history solely through the prism of our own times. Or, even worse, looking at history through the lens of today's values. It is not a compliment to our secularized society that we are obsessed with a man's, or woman's, weaknesses to the exclusion of their gifts and their accomplishments. Kennedy helped begin, but could not finish, the civil rights revolution. He might have stopped the Vietnam War. He slashed income taxes, incubated Medicare and the Peace Corps, prosecuted the Mafia, defied the Soviet Union at the Brandenburg Gate in Berlin and endowed America's victory in the space race. And he took a lot of pills. Suffering can deepen a man, and stimulate his better nature, make him empathetic. Kennedy's ceaseless pain, and his brushes with death in the Pacific and on the operating table, did not dull his wit, or make him shrink from life or from people. It made him more courageous and cerebral. Who else would you have had at the helm during the Cuban Missile Crisis but a man like that? A Picture of him visiting my grandfathers Barbershop in 1956 in Ipswich, Massachusetts during his Senatorial campaign hangs in my house. It hung in his shop as if he were family. His idealism and ideas of creating the Peace Corps is truly an awesome contribution to american citizens and people throughout the world. He and Bobby had courage in political life. I think if he had a full life, the Peace Corps would be a different place.